It’s not only at Singapore, but here the phenomenon is amplified. The answer to a fast growing population on an island, the government decided to build many different complex buildings. The Housing and Development Board (HDB) project was created for low income and helps mainly 80% of the population on the island. Each HDB flats complex is working like a small town in which you have a food court or hawker center where people can eat for few dollars, all the shops amenities one fancy as well all the medical or schooling necessarily for the complex to self survived. I am sure that older people would find all their need in their HDB. The community formed there is a strong and helpful one. In a hot and poor country, windows are usually open most of time giving a chance to exchange a piece of people life when wind blows a bit stronger than usual. 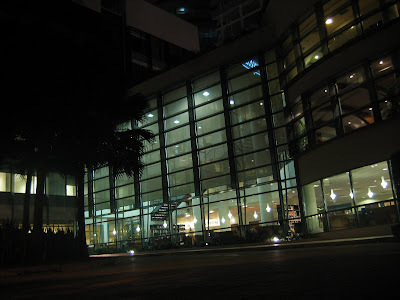 Here, one might hear the fight that happen on the second floor, here one might see the under wears of the new beautiful lady from the 14 floor, or one might see that the old man is always sleeping watching channel 8 during the afternoon. No more private life, only a public one. These walls of apartment are very impressive during the day, because you have enough space to embrace them from very far away. 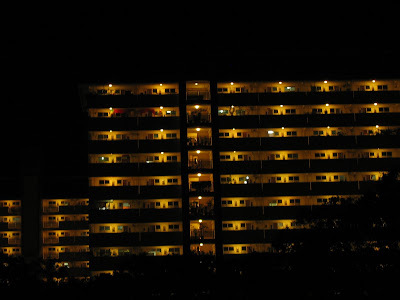 But it is a night time that HDB are even more impressive. Like sleeping giants, they take their lightning armors and wait for the sun to rise. 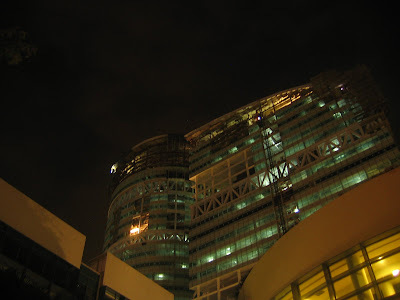 I often try to capture the immensity of the HDB in one picture, but I do not give justice to the size, the life or even the form of buildings at night. One day I will take a proper picture I am sure of it. When you think about it, only a street culture can exist in Singapore. There is no country side after all. Taking your car and running away to the cottage house is out of the equation. I expected to see a more vigorous street urban culture, where graffiti and other street vendor outfit will fight each other to supply the vast majority of the local kids. I was wrong, the sub-urban culture is underground, and I only saw it surfacing at two occasions. Once was at a party where the DJ tried to explain in music without much success, that Hip-Hop was not a evil music to a sitting crow which was sucking up with passion on their straw. The second time was at the stake park. Behind the Somerset subway stop, and between buildings in a middle of nowhere, a Skate ramp was build up where kids of all age try to impress their colleagues on how to jump high and fly low. Beside the fact that nobody is talking, and almost everyone is listening to an iPod, the ramp can not provide enough adrenaline to lift up the random spectator that I was on my multiple occasions on my way back home. I would have like to see something higher and stronger, but after all this is Singapore and having a place to catalyze the young urban energy is not that bad. Kids are rolling from one instrument to the other in a very coordinated and civilized way, very opposite of the skateboarding principles that Thrasher Magazine was once proud of pushing ahead in the face of the world (Skate and Destroy). The skate-boring community is growing in Singapore, slowly but surely, and will maybe one day extend to a second skate park. This day is not yet there, and I am glad to witness the ever changing graffiti competition on the single wall that the city offers to the underground urban artists.